Metro Crossing is the next level in modern living. 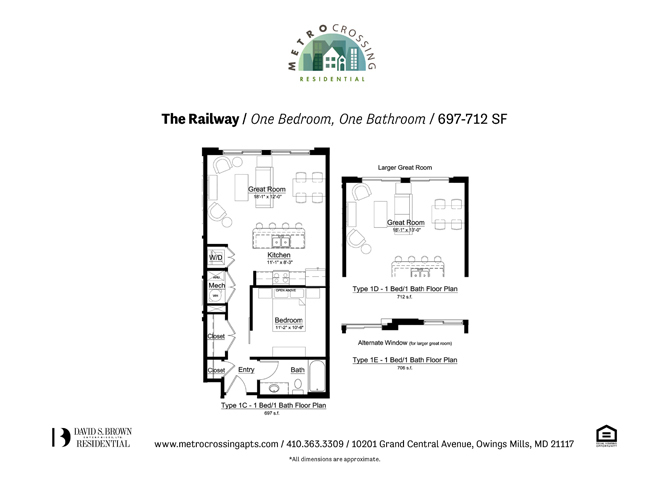 Located at Metro Centre in Owings Mills, this apartment building offers 1-bedroom and 2-bedroom apartments just steps from the Owings Mills Metro Station. Enjoy contemporary and convenient features in every unit, plus a wealth of community amenities – including a two-level club room, rooftop reflection pool and lounge, and fitness center with adjoining yoga room. In the heart of the Owings Mills Metro Centre, a Transit-Oriented Development just 15 minutes from Baltimore, Metro Crossing is surrounded by all you need to live, work, and play in one place. With a variety of shops, restaurants, office space, and community events, Metro Centre offers a walkable, bikeable neighborhood with all the excitement of city living. These Owings Mills apartments are all equipped with contemporary amenities and appliances. With modern kitchens, walk-in closets, and pet-friendly units, Metro Crossing apartments have everything you could need and want in a luxury home. We have teamed up with SemaConnect to provide our residents with two electric charging stations, located conveniently in the garage. Click the link below to learn more about SemaConnect! Located just outside your front door is Metro Centre, your one-stop shop for retail and dining. In the heart of Owings Mills, Baltimore’s fastest growing neighborhood, everything you need is just a short walk away at Metro Centre. Enjoy local food and shopping experiences at places like Eggspectation, Suya Spot, Times Square Kitchen, Subway and Honey House. Local neighborhood attractions also include Baltimore County Library and Community College, Foundry Row, Stevenson University, and whenever you need to get into the city, downtown Baltimore is just a short 15-minute metro ride away. Is your company a David S. Brown preferred employer? If so, you may qualify for added move-in benefits. Stevenson University, T. Rowe Price, CareFirst, and many other local employers are included. Get familiar with David S. Brown’s Preferred Employer Program by clicking the link below. I have lived at Metro Crossings for just over 2 years. If you’re looking for cleanliness, security & a peace of mind then Metro Crossings is your place! The Office Staff is always willing to assist whenever you have a question or concern. Whenever you have a maintenance issue Natasha or her staff gets someone there that same day or first thing the next morning! I have lived at the Metro Crossing since June 2016. The property speaks for itself; beautiful apartments with plenty of amenities onsite. Needless to say, the David S. Brown business development initiative lends itself to incremental improvements in a community that is already exceptional and unique. The more businesses that open up, the more options for residents like me, who value having the restaurants and retail stores within walking distance. Natasha Edwards and her team are A+. Managing an operation with so many moving parts is quite challenging. They provide an outstanding, highly-valued sense of service to the place that I choose to call home. Metro Crossing is a great place to call home. I have lived here for 3 years. The prices are very reasonable for the apartments that they offer. The complex is awesome. The amenities and club house are great. The leasing staff is very professional and prompt. I would highly recommend you to stop in and take a tour, you won’t be disappointed!